Sue Eves is a LibraryThing Author, an author who lists their personal library on LibraryThing. See Sue Eves's author page. About meI am a children's author. My first picture book HIC! is published by Random House (Bodley Head). It is the only book I plan to illustrate as I prefer writing! 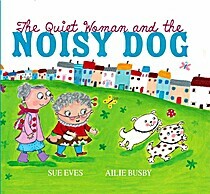 5th February 2009, Andersen Press published my picture book THE QUIET WOMAN AND THE NOISY DOG (Illustrated by Ailie Busby). THE MAGIC CAFE is my first children's novel written in collaboration with Alix Parker under the name of Fox E Parker. About my libraryMostly contains children's books I've read and collected recently.